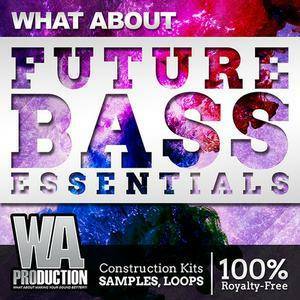 'What About: Future Bass Essentials' by W.A. Production brings you more than 2 GB of the freshest Future Bass and Chillstep sounds, including 10 Construction Kits, kicks, drum loops, snares and presets for Sylenth1, Spire & Massive. Inspired by artists such as Flume, Wave Racer, Casmhere Cat and others. This product includes all the tools you need to create you own beautiful Future Bass tune and more. The W.A. Production team has created a big collection of extremely useful and powerful sounds that will allow you to be a part of this hot genre. Inside this product you will find 10 Construction Kits and 370+ deep kicks, crispy claps & snares, playful percussion, complex drum loops, MIDI and Sylenth1, Spire & Massive presets.